There’s one area of living that the tech giants can’t take from us and it’s our precious beauty salons. Early on, venture capitalists jumped on a handful of native-to-mobile on-demand beauty start-ups that allowed for a range of services to be performed in a client’s home at the push of a button. “Low overhead” and “services in the comfort of your home” were among the terms thrown around at the onset of the craze — perceived upsides of a beauty service provider living solely online. “People are lazy” was the thinking. But companies from Bonobos to Bauble Bar soon found that obstacles — brand awareness and customer acquisition costs, among them — made an off-line presence necessary, if not mandatory. 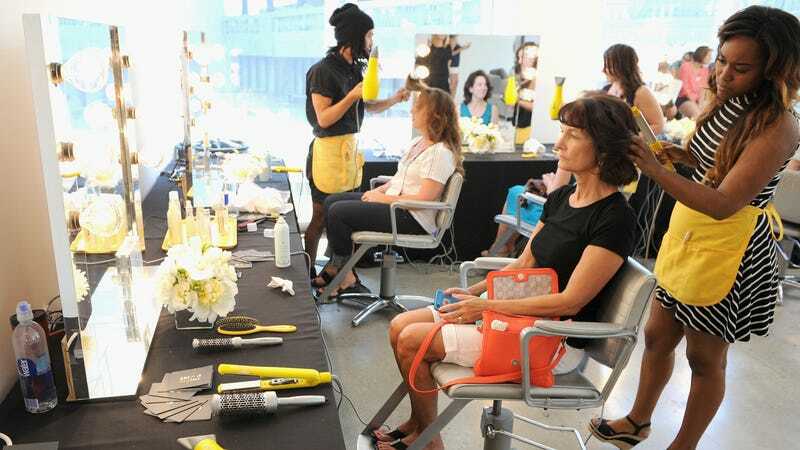 Vênsette’s $100 blowouts were too expensive for most customers — but Glamsquad undercutting brick-and-mortar competitor prices to build a customer base isn’t sustainable either. The difference, though, is that users don’t care who their Uber driver is; they do, however, care about who is styling their hair or applying their makeup. “It’s a very personal relationship… and if there’s a desire to repeat with a specific service provider, should you like them, you can’t. With a Glamsquad, you don’t understand who you’re getting [to style your hair], and if you like the person it’s really easy to establish a relationship and offer to pay them off platform,” [investor Clara] Sieg said. Any frequent salon visitor knows the struggle of salon-hopping to find a reliable stylist who truly “gets” your hair. This was especially challenging for me years ago when I moved out of my mom’s house to an apartment in Astoria, Queens, where I couldn’t find a local salon that specialized or even understood black hair textures. I wound up getting regular perms at a Brazilian spot, which was fine but not the same, and then I went natural. Last year, I discovered an app called Swivel (this is not an endorsement) and used it to book a hair-braiding appointment—the stylist was amazing, but I have not used the app since. Instead, I can just text my hair-braider to see me. I also still have yet to find a reliable salon and stylist for my natural hair. I’d love if a hair stylist would just come to me, but first I would need a large sink and, also, space and to know that person won’t ruin my hair. “That’s not the case. On-demand services are complementary to traditional treatments. On-demand is usually better in terms of convenience — you’re at home, relaxed — while traditional locations deliver a more sophisticated experience,” Plana Cros said.